Renovated stone house with detached barn in quiet position. A particular feature of this property was the well stocked, landscaped gardens of just over an acre - they are now overgrown and need plenty of TLC to return to their former glory. The house itself has been completely renovated but would now benefit from some re-decoration and the second floor bedroom requires finishing. It benefits from double glazed windows and a woodburner provides the heating. 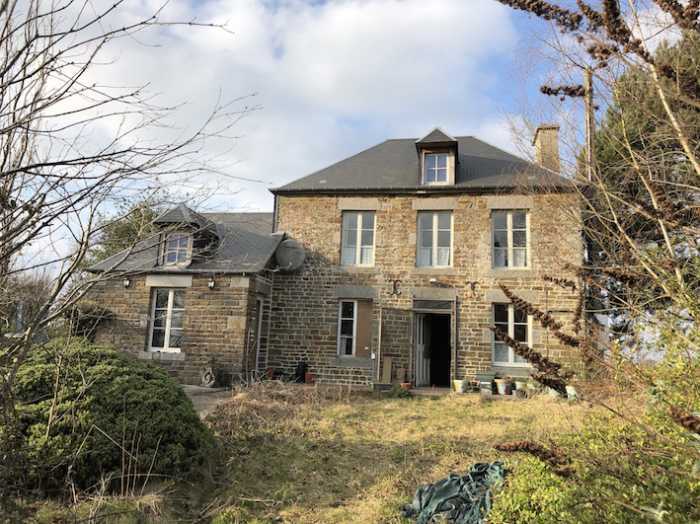 There is a separate detached old stone house which could be renovated to create a gîte (subject to planning). Viewing is highly recommended. The house stands in a quiet rural hamlet with one other property in a slighly elevated position with views over the gardens and surrounding countryside. It is near the Town of Vassy (6km) in the Calvados department (Normandy region) in the north of France 43 km from Caen, the department capital. Vassy is 221 km from Paris (mainline train station at Vire (15 minutes away) and 295 km from the port at Calais. Rennes – Saint-Jacques Airport (RNS) is approximately two hours and 10 minute’s drive from Vassy. Flights arrive here from Southampton year round as well as seasonally from Cork, Dublin, Edinburgh, Exeter and Manchester. Many activities are available for those staying in Vassy with lots of glorious countryside to be explored making this ideal for hiking, horse riding and cycling. There are public tennis courts nearby in the area as well as several golf courses including one a Clécy, which is 20 kilometers from Vassy and the 18 hole Golf de Vire. Study 3.20 x 2.37m Window to front elevation. Tiled floor. Telephone socket. Exposed beams. Bathroom 3.02 x 2.05m WC Window to rear elevation. Bath with mixer tap/shower fitment and tiled surround. Hand basin. Landing Window to rear elevation. Stairs to second floor. Exposed stone wall and beams. Bedroom 1 3.39 x 2.665m Window to front elevation. Bedroom 2 4.24 x 3.56m 2 windows to front elevation. Built-in cupboard. Exposed beams. Shower Room 2.13 x 2.00m Window to rear elevation. Pedestal basin. WC. Shower. Bedroom 3 4.00 x 2.13m (to finish) Velux window to rear and window to front elevations. Inset spotlights. Sloping ceiling. Utility Room/Store Room/Workshop 5.24 x 3.20m Double sink unit. Space and plumbing for washing machine. Built-in cupboard. 2 windows to rear and window to front elevations. Partly glazed door to terrace. Gravel drive leads to car port constructed of corrugated iron. Concrete patio area. The garden is laid to lawn with mature trees and shrubs. Separate detached old stone house divided into two parts. Room 1 - 4.85 x 4.48m constructed of stone under a corrugated iron roof. Fireplace. Window and 2 doors to front elevation. Room 2 - 4.48 x 2.44m Window to west and door to front elevations. Mains water, electricity and telephone are connected. Broadband internet connection believed to be available. Woodburner. Drainage to a septic tank. Please note : There is no Energy Report for this property as there is no central heating.